Community halls don’t suffer from many of the time constraints imposed by pubs, restaurants or hotels but of course they do bring their own problems. Often they are run by committees and of course everyone on the committee will have a valid opinion and will want their voice heard and as the range of uses is often very diverse so are the challenges. So how can we help get your community hall sanded and finished to a high standard and keep everyone happy? Let’s start with your local fully trained and qualified local Affiliate. He may not work or live in the same town or village but he will be a family man running a nearby business and offering quality local solutions to your flooring problems. But he is not isolated and nor are you, he is part of a much larger organisation that works in conjunction with a major multi-national giving you and your fellow committee members the confidence that comes with dealing with the largest floor sanding brand in Europe. Your local Affiliate will come to your Community Centre and talk to any of the members who wish to meet him or her. 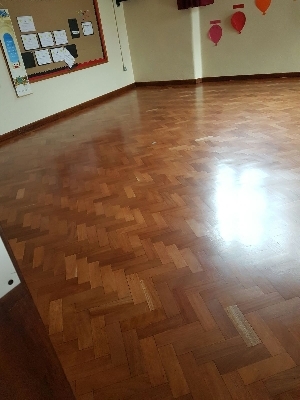 He will listen to their opinions and concerns and offer the best solutions to ensure your community hall floor is not only finished to the highest standard but you get all the help and advice you need to keep it looking that way at an affordable price.